Scientists at BGS have been getting better at communicating what they are up to beyond just those in the know. In fact, they have been getting so good at it that they have won an award! In mid June, there was an awards ceremony in Sheffield, where the finalists gathered to see who would be selected to win Team of the Year at the PraxisUnico Impact Awards 2017. This award is aimed at recognising knowledge exchange (a mutually beneficial exchange of ideas, data, experience, and expertise) between organisations like BGS and external researchers, commercial groups and the public. Dr Katherine Royse, Science Director of BGS’s GeoAnalytics and Modelling Directorate, went along to the gala dinner knowing her team was a finalist in the Team of the Year Category up against some stiff competition. To her absolute delight, they won! The GeoAnalytics and Modelling Directorate is a part of BGS that aims to explain, explore and predict the Earth’s response to natural and human-induced environmental change. Building better partnerships with the user community was a key part of the success of the team. By understanding the community’s needs, the GeoAnalytics and Modelling Directorate have been able to develop usable and understandable bespoke products and services. These include but are not limited to power networks, engineering consultancies, transport providers and the insurance sector, all of whom have contributed to the development of a number of key products and services to date. In early June each year the International Continental scientific Drilling Program (ICDP) committee meets to assess applications for drilling deep holes in the Earth. This year the meeting was held in Kiruna in northern Sweden. Here Melanie Leng explains a bit about ICDP, the UK’s geoscience ICDP community, and her trip to Kiruna as the UK’s representative on the ICDP Executive Committee. The UK is a member of the ICDP and this enables consortiums of geoscientists from the UK (in collaboration with other member countries) to apply for funding to deep drill the Earth through many kilometres of sediments and rocks in order to get cores of pristine material for scientific study (take a look at the ICDP website for more information on current projects). There are many reasons we want to take long cores through the Earth and like many applications we assessed in Kiruna, they often involve assessing natural hazards including volcanos and earthquakes, natural resources and understanding palaeoclimate. Both pre-drilling workshop proposals and full drilling proposals were assessed at the meeting and the outcomes will be published on the ICDP website in the coming weeks. As part of the meeting the ICDP committee also visited the Kiruna state mine (owned by LKAB), the largest underground iron ore mine in the world. The mine has an annual production capacity of over 26 million tonnes of iron ore. The Kiruna ore body may have been formed from volcanic activity where iron precipitated into a syenite porphyry rock and was then tilted to 50 – 60°. Currently the iron is mined at a depth of over a kilometre. Back to ICDP, the UK has key personnel within the program. Prof John Ludden (BGS Director) sits on the assembly of Governors, I sit on the Executive Committee and Dr Kathryn Goodenough (BGS) is the Chair of the science Advisory Group. Please feel free to contact us about ICDP activities. The next deadline for ICDP drilling and workshop proposals is January 2018. You can also keep up to date with ICDP-UK through our website. geological sites in the world. Scotland has an outstanding diversity of rocks and landforms created by natural processes over the last 3 billion years or more of the Earth’s existence. They are part of Scotland’s rich geodiversity – the variety of rocks, minerals, fossils, landforms, sediments and soils, and the natural processes that form and alter them. Together, the particular elements of geodiversity record the Earth’s history, as pages of a 'great stone book', and form part of our natural heritage to be passed on to future generations. Internationally, Scotland is regarded as the birthplace of modern geoscience, led by geologist James Hutton in the late 18th century. 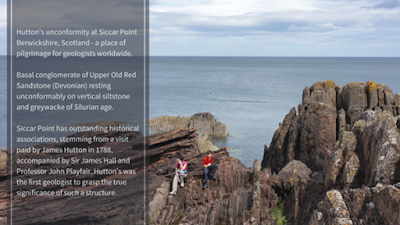 At Siccar Point in Berwickshire, Hutton and John Playfair (Scottish Geologist and mathematician) unlocked ‘the abyss of time’ and presented a vision of a living world that recognised the crucial links between geology, soils, plants, animals and human beings. Our geodiversity is an asset of national and international importance with many sites celebrated around the world and contributing key aspects of world geoheritage. Our geodiversity is vital for interpreting past geological processes of global significance, such as plate tectonics, mountain building, volcanism, carbon cycling and glaciation and some of Scotland’s rocks also contain a rich variety of fossils that have significantly advanced our understanding of the evolution of life. Geodiversity is vital as the foundation for biodiversity. The nation’s diverse assemblage of landforms, soils, water, nutrients and natural processes support nationally and internationally important terrestrial and marine ecosystems and species, and Scottish soils store large amounts of carbon, an important consideration in climate change mitigation. We live in a dynamic landscape where understanding of river, coastal, subsurface and slope processes are a vital part of nature-based solutions to management of hazards such as flooding, sea-level rise, coastal erosion, subsidence and landslides. The distribution of rocks and landforms has shaped human activity in Scotland, from the earliest Palaeolithic settlers up to the present day, influencing sites of settlement, land use and water sources, while the variety of Scotland’s building stone resource is reflected in the local character and distinctiveness of our built environment. Scotland’s geodiversity forms the bedrock of our varied landscapes and spectacular scenery that attracts visitors from around the world and forms a vital part of our economy. Our landscapes also provide the stage for diverse recreation and outdoor activities, contributing to the economy and people's health and wellbeing. 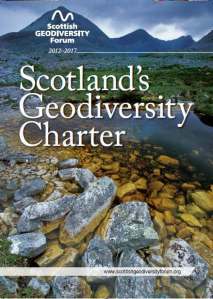 But perhaps the best description of the importance of geodiversity to Scotland can be found in the Scotland’s Geodiversity Charter (the first of its type in the world) prepared by the Scottish Geodiversity Forum and partners. It presents a vision that geodiversity is “recognised as an integral and vital part of our environment, economy, heritage and future sustainability to be safeguarded for existing and future generations in Scotland”. 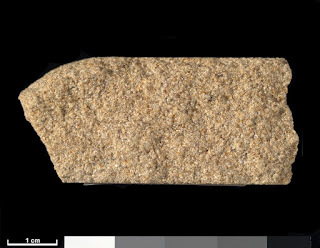 This blog was first published in Scotland's Environment's blog section 'Our rocks and landforms: the great stone book of Scotland'. Over the next few weeks the blog will be exploring the exciting projects that their partners are working on in this area and looking at the maps, data tools and information available on their website. The British Geological Survey (BGS) is a major partner in a scientific programme called ORCHESTRA (Ocean Regulation of Climate through Heat and carbon Sequestration and Transport) which has been running for over a year. The project aims to improve our ability to understand and predict the role of the Southern Ocean currents to modulate global climate. The BGS’s contribution to this research is to analyse the oxygen and carbon isotope composition of the ocean waters from the World’s oceans over a 5 year period. In particular the carbon data will be used to investigate where carbon is ether absorbed by the ocean or expelled into the atmosphere. This is particularly important as the oceans regulate atmospheric CO2. once we were back on land. In May during a mini heat wave, myself and Melanie Leng set off on a trip to collect an average sea water. Our closest coast (North Norfolk) was chosen. We booked a couple of slots on a fishing boat and sailed about 2 miles from the coast. We carefully collected the samples for the different labs while being watched by a dozen tourists who were there for the fishing. These samples have now been packed up and sent around the world. At the BGS we have started our measurements, and look forward to receiving the data from the other labs. Being able to reproduce sample analysis within a single laboratory and also checking different labs get the same data from comparable samples is an important step in any experiment design. 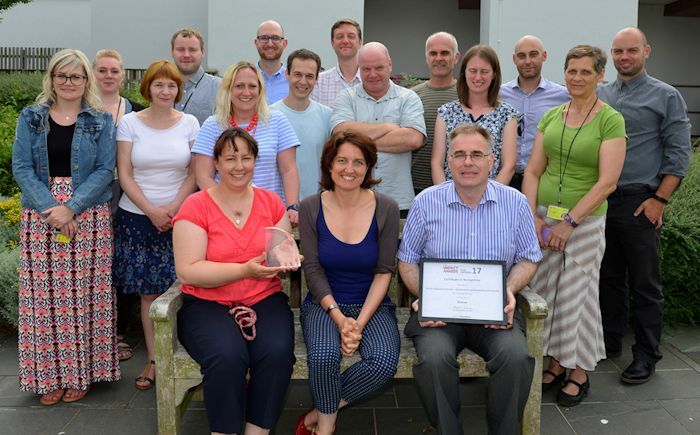 The ORCHESTRA project is led by Prof Mike Meredith at the British Antarctic Survey. For further details please go to our website. The Geological Survey of Northern Ireland (GSNI) is just one of numerous science directorates at the British Geological Survey. 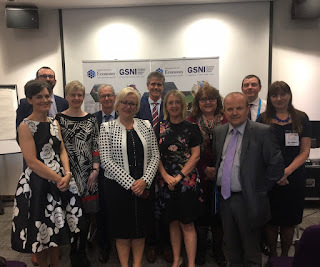 However, despite being staffed by scientists from the BGS, the GSNI is unique in that it is also an office of Northern Ireland's Department for the Economy (DfE) and sits very firmly within the Northern Ireland Civil Service (NICS). At the end of May, the NICS put on the biggest public sector showcase of the year, NICS Live, when various sectors of the NICS get the opportunity to showcase the work that they do and highlight how this benefits the citizens of Northern Ireland. The event brings together leaders from across Northern Ireland's public sector to share best practice, promote innovation and discuss how to better deliver public services for citizens. Presenting at this huge event is a competitive process and applications have to be submitted well in advance before being assessed by a number of senior managers. GSNI was the only office of the DfE that won a place at the event and we took full advantage of this opportunity. Not only did we emphasise the huge part that geoscience plays in Northern Ireland's economy, but also how it benefits all other sections of society. Before the event, we compiled a number of core messages, all designed to highlight the huge impact of GSNI and the geoscience sector as a whole. Developing the economy: we support Northern Ireland's economic sector and job creation a number of sectors including aggregates, valuable minerals, oil & gas, and geothermal. Research, data and innovation: our scientists acquire, maintain, analyse and interpret geoscience data to support and inform decision-making. Underpinning infrastructure: we supply information on geology and ground conditions to develop Northern Ireland's transport, utility, energy networks and construction sector. Monitoring the environment: we provide information to help protect and sustainably manage Northern Ireland's natural environment. Enhancing tourism: we provide advice and guidance on developing our natural landscape for sustainable tourism. Protecting human and animal health: we assess and mitigate risks to human and animal health from natural hazards. Supporting education: we help to develop and design resources for schools that educate and inspire future earth scientists. Our core messages were all presented at a fully interactive exhibition stand that was available for all delegates throughout the day and through this, provided a number of new points of contact within various sectors of the NICS. Science and Technology, Prof Mike Stephenson. Our talks programme was called 'Understanding Underground: geology forms our landscape, resources our economy and underpins our infrastructure'. This rather ambitious event put particular emphasis on the positive partnerships that GSNI has developed over our 70 years of publics service. Given that we only have 12 scientists working at GSNI, it is these partnerships that have helped us to achieve our high level of success in such a diverse range of sectors. Speakers at the 'Understandng Underground' session. The programme was opened by Prof Mike Stephenson, BGS's Director of Science and Technology, who set the context. This was followed by a session on Research and Innovation by Dr Marie Cowan, Director of GSNI and Dr Jennifer McKinley, Director of Research at the School of the Natural and Built Environment at Queen's University Belfast. Next up was a session on Minerals and the Economy by Dr Mark Cooper, Chief Geologist at GSNI together with Gordon Best, Director of the Quarry Products Association NI. Geothermal Energy was next on the agenda and was delivered by Derek Reay, Team Leader at GSNI and Ric Pasquali, Chair of the Geothermal Association of Ireland. The session finished with a session on Geology and Sustainable Tourism by Dr Kirstin Lemon, Team Leader at GSNI and Tanya Cathcart, Marketing Manager at Fermanagh Lakelands Tourism. The entire programme was chaired by Lorraine Fleming from Mineral and Petroleum Branch at DfE and was closed by June Ingram, Director of the Energy, Telecoms, Minerals and Petroleum Division at DfE. Over 1000 delegates attended over the entire day and the talks programme was fully-booked with approximately 100 people present. 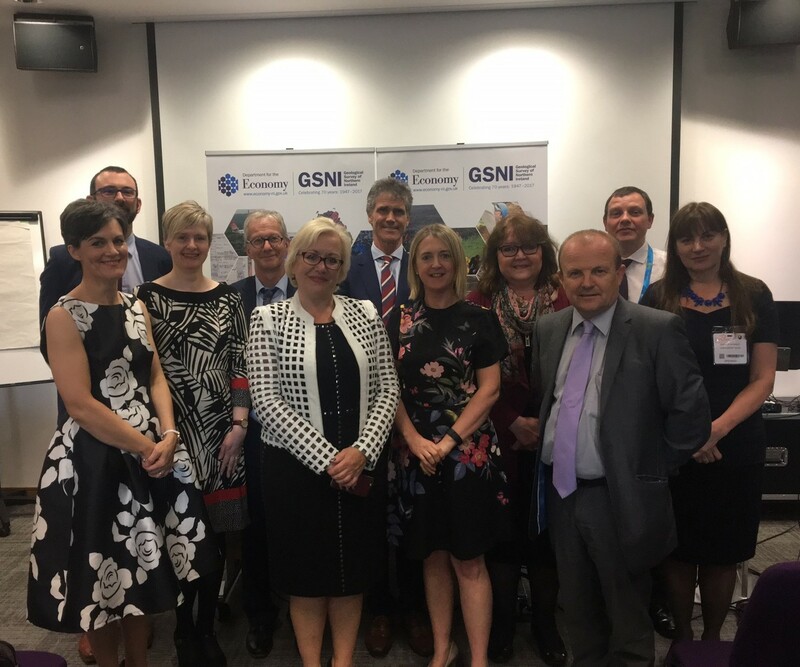 Of the 98 delegates who registered to attend GSNI's talk session, almost 1/3 were from Grade 7 (Principal Officer) to Senior Civil Service grades from all nine Northern Ireland government departments and the Northern Ireland Office, which demonstrates the breadth and depth of the impact. Afterwards, Twitter was singing the praises for the DfE and GSNI, in particular, complimenting the gender balance of speakers and DfE senior female representation. 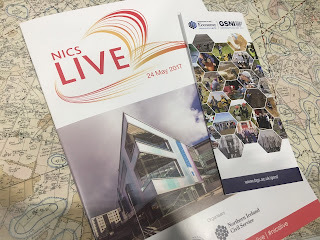 We hope that by attending and presenting at NICS Live we have been able to not only increase the awareness and understanding of what GSNI does, but also highlight the impact that our scientists have on not just the economy, but on all elements of the lives of each and every one of Northern Ireland's citizens. Clive Mitchell is Head of Communications for the British Geological Survey (BGS) responsible for communicating the science of the BGS. 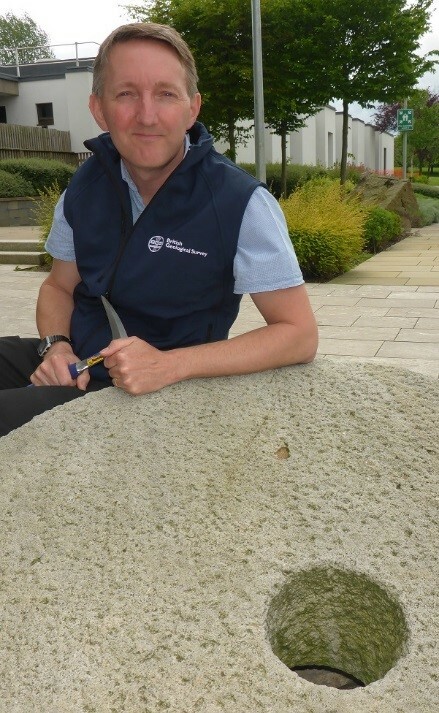 He is also a senior industrial minerals specialist, secretary of the Extractive Industry Geology conference, a Chartered Geologist, responsible for MineralsUK website and a member of the British Standards Institute (BSI) technical committee for aggregate test methods. This blog was originally written for the Institute of Quarrying (IQ) Quarry Garden project, on display at the RHS Chatsworth Flower Show in celebration of 100 years of the IQ. My thoughts of Derbyshire are usually full of the walking routes I’ve followed across the Peak District. As a geologist, the contrast evident in the geology of the White and Dark Peaks is stark. The seemingly peaceful, verdant green pastures, drystone walled farmland of the limestone dales surrounded by the brooding heathland moors and the dramatic sheer-sided edges of the gritstone uplands. For the keen observer, the evidence of past industry and human ingenuity is all around, often overgrown and gently merging back into the landscape. My walks often take me along canal tow paths and mineral railway lines, through rocky cuttings, dripping tunnels and steep inclines, which provided the mills, factories, stone quarries, lime kilns and farmers with access to markets in the surrounding cities. It’s hard to envisage the roar of the engines, the huge volume of material and the large number of people that must have passed along now largely tranquil routes such as the High Peak, Tissington or Monsal trails. The limestone and gritstone forming the Peak District are sedimentary rocks that have been a source of valuable materials since the days of Romans lead mining. Alongside the Coal Measures in the east of the county, these rocks were deposited in the Carboniferous over 340 million years ago and are exposed in the north, east and part of the south of Derbyshire. The younger geology of north-east Derbyshire includes high quality Permian-age dolomite (‘Magnesian Limestone’) that is the raw material for magnesia refractories and was in the past used as a valuable ‘freestone’ to build the Houses of Parliament. In the south of the county, sand and gravel is produced from the Triassic Sherwood Sandstone and the river gravels in the Trent valley. The modern day focus of the minerals industry in Derbyshire is the quarrying of construction minerals, particularly limestone, sand and gravel, brick clay and sandstones, and also industrial minerals including industrial grade limestone and dolomite. From L to R: Sheep Pasture Incline, High Peak Trail, Derbyshire; Dene Quarry (disused), Cromford, Derbyshire. Some of my favourite places in Derbyshire are the ‘Blue John’ caverns at the western end of the Hope Valley near Castleton, where the fabulous purple fluorspar is still mined, although on a very small scale. Fluorspar is one of the few minerals to be worked on an industrial scale within the Peak District National Park (for example, near Stoney Middleton) as it is a considered a resource of national strategic importance. Some superb examples of Blue John used in table tops, inlays and vases can be seen in the mineral collection in Chatsworth House. Ashover Grit, Stanton Moor Quarry, Matlock, Derbyshire. Chatsworth is a fitting location for the Institute of Quarrying (IQ) Quarry Garden at the RHS Chatsworth Flower Show this year (7-11 June 2017). As with many buildings in the Peak District, it is built with locally quarried stone. The main house is built using Ashover Grit. This is an attractive honey coloured sandstone with Liesegang rings (formed by iron staining) and was quarried a few miles away on the hills overlooking Bakewell, a stone’s throw from the Monsal trail. The Ashover Grit also forms the bedrock below Chatsworth House itself and was recently quarried at Burntwood Quarry. This quarry, located on the Chatsworth Estate, was reopened 100 years after it was last worked and was totally overgrown. The stone produced is part of the current restoration work being carried out at Chatsworth House and was also incorporated into the IQ Quarry Garden.